Myles Anderson lays out another home-run on Search Engine Land with his data on how people use their smartphones to find local businesses. Since a lot of you read this blog to get exactly this kind of insight, I thought it was worth re-posting here. Be sure to subscribe to his Twitter feed at the links above to get more content like this straight from the horse’s mouth (and I still don’t even know what that phrase means…). The staggering growth in smartphone and iPad/tablet usage is changing the way consumers behave. Having these powerful devices glued to our hands 18 hours a day changes how we manage our lives, stay in touch with friends and consume media. It also affects how we find and engage with businesses and services, and no more so than at a local level. We (BrightLocal) conducted a survey with our consumer panel to find out just how consumers use their mobile devices to find local businesses and what content was most important to them when using their mobile devices (we specified ‘mobile phones and tablets’). We asked 6 questions and received 1,065 responses to the survey. The following charts and analysis represent the full findings of the survey. 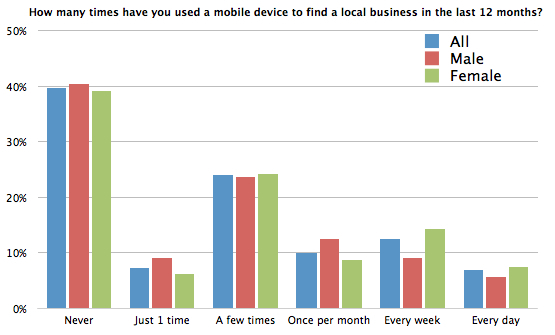 How many times have you used your mobile / mobile device to find a local business in the last 12 months? 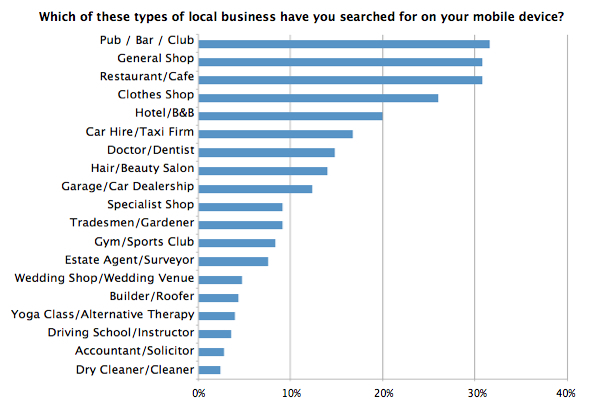 Which types of local business have you searched for on your mobile device? 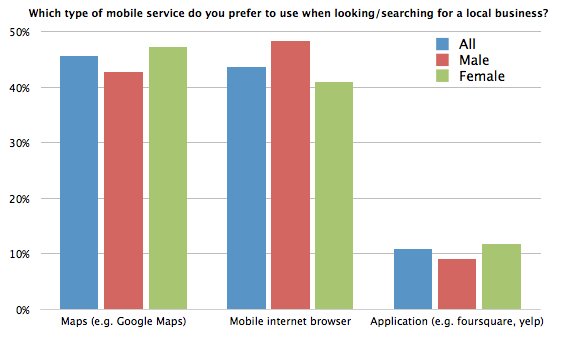 Which type of mobile service do you prefer to use when looking/searching for a local business? 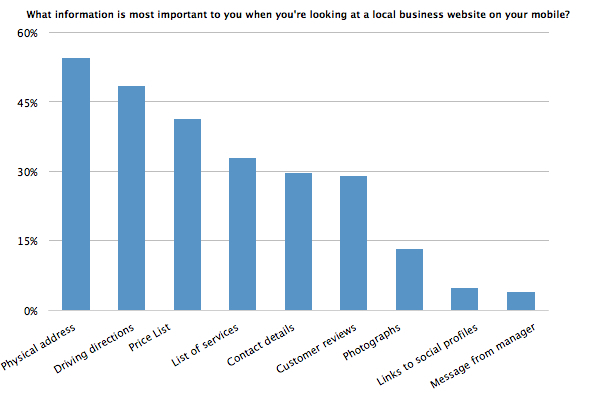 What information is most important to you when you’re looking at a local business website on your mobile? 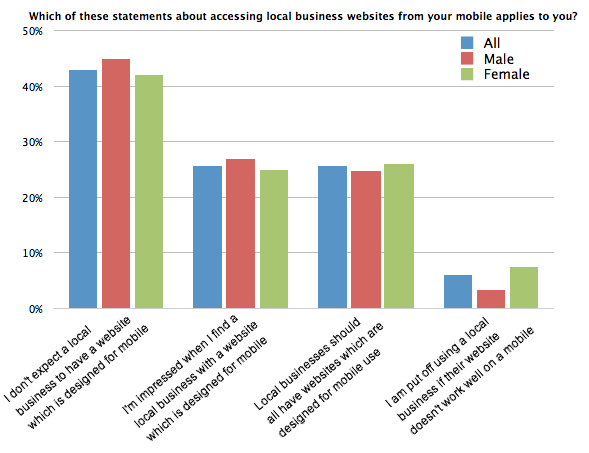 Which of these statements about accessing local business websites from your mobile applies to you? Are you more likely to contact a local business if they have a mobile optimized site? Only 29% of consumers regularly use mobile devices to find local businesses. Mobile Internet usage is growing hugely; but, only 29% of consumers regularly use their phones/tablets to find local businesses. Forty percent (40%) of consumers say they have never used their phone/tablet to look for a local business. However regular, repeat usage is relatively high with just 19% of consumers looking for a local business at least once per week, and 29% of them doing this once per month. It’s beneficial for owners of all types of local business to make themselves as findable as possible to mobile users. But, it’s especially important for bars, cafes, restaurants, shops, hotels and taxi firms which have the most to gain by ensuring their presence on mobile in prominent and positive. Eighty-nine percent (89%) of local consumers prefer to use either a maps app or an Internet browser when looking for a local business on their mobile. Just 11% of consumers prefer to use other applications such as Yelp, Foursquare or TripAdvisor. The volume of App downloads hit record highs in the final week of December 2012 (1.7 billion apps downloaded in 1 week* — fuelled by consumers receiving new devices for Christmas and activating them in the week after), but the preference to use apps instead of native mapping and browsers installed in devises is still low. Maps and browsers come pre-loaded onto devices, so they’re ubiquitous and convenient for users to use. They also benefit from familiarity as these brands (e.g., Google Maps, Safari) are household names and have huge user numbers in the PC market. Mobile users are very action orientated when they look for a local business on a mobile device. They quickly want to qualify whether a business meets their requirements. Softer and less ‘action’ orientated content such as reviews, photos and welcome message are much less important. Interestingly, only 30% of users considered ‘Contact Details’ to be an important piece of info. Maybe because mobile users are looking for a business to visit, so their address is enough for them to act upon. Make life easy and quick for your mobile site visitors. Display the most important data prominently on the homepage of your mobile optimized site. You can still include richer information (reviews, photos, etc. ), but put this on other pages and link to it from the homepage. 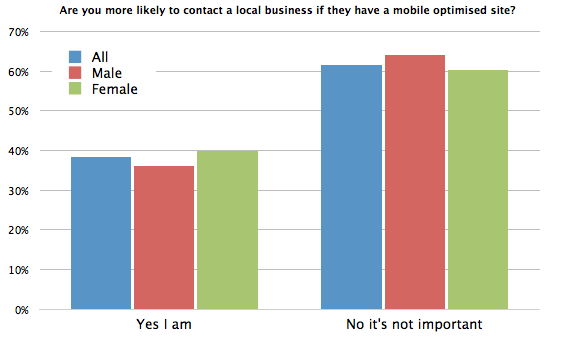 Consumers are split on their attitudes to whether local businesses should have a mobile optimized site. Forty-three (43%) say they don’t expect a local business to have a mobile optimized site, while 26% also say that all local businesses should have a site which is built for mobile. A further 26% of respondents said they are impressed when a local business has a mobile optimized site. 38% are more likely to contact a local business if they have a mobile optimized site. Thirty-eight (38%) of consumers are more likely to contact a local business if they have a mobile optimized site. That would represent a significant bump in customers for any business and would surely justify the expense and effort in building a mobile optimized website. Mobile users behave differently from normal PC Web users, and this can impact on how they find a local business and which local business they end up contacting/visiting. Mobile users are very action orientated and will act quickly upon the results of their searches. All types of local business can benefit from improving their mobile presence with 38% of consumers more likely to contact a local business with a mobile optimized site. 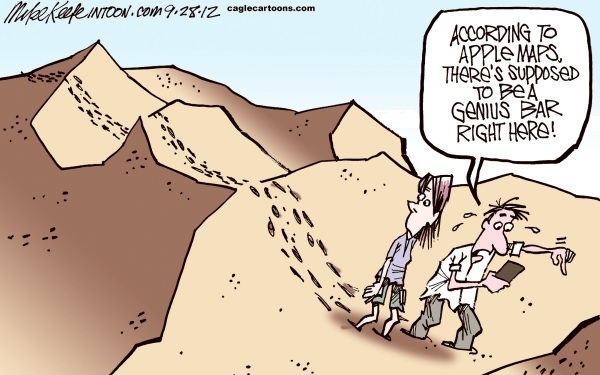 In addition to that, even if you spend the time figuring it out and then going to do all the manual work (and trust me, there’s a ton) – Google is constantly changing the rules, and therefore the landscape of who is getting found and why. From your location to your reviews to your business name itself – there are so many factors that you can’t change or manipulate to be more attractive to El Goog – which is a big reason Google has structured its algorithm the way it has. Over lunch today, some of RevLocal’s clients here in Columbus came in to see a presentation on leveraging Google from Google themselves. There are several levers you can pull to impact the factors above. 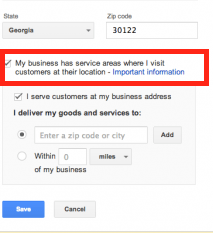 At first, one might think there’s nothing that can be done here – but in reality, Google uses over 250 different business directories and databases to correlate your address information. If those addresses differ in any way (“W.” instead of “West” or “St.” instead of “Street” for example), that information will appear as a collision to Google and your listing will lose relevance. Does your business provide what the searcher is looking for? 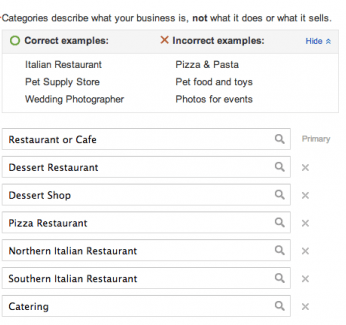 Google wants to do ONE THING for the searcher: Give the right answer. Are you the right answer to their question? What is the relative electronic prominence of your business compared to the other relevant businesses in the area? Where have you been mentioned in the press? What do your reviews look like? Do you have photos and videos where the Search Engine can easily find them and give you credit for them? Their presentation was extremely enlightening for me and I thought I would share some of the nuggets they laid out. Feel free to share with me if you make some good use of them!